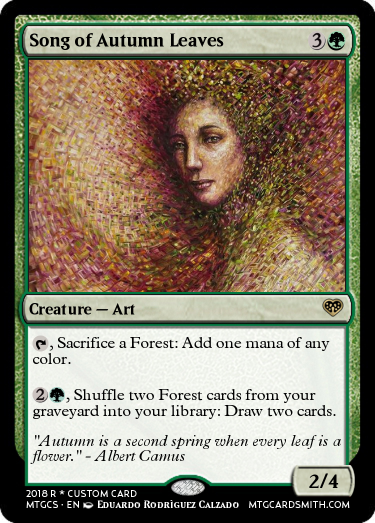 For this short contest, I'm asking you to help design an important piece of the MTGCardsmith community Renaissance Set codename Rezatta: the Living Art creatures! 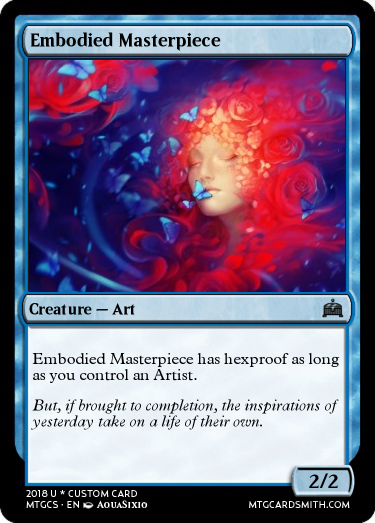 Design one or more cards that show Art coming to life. - You can design either a living piece of Art, or something that creates a living piece of Art, like an artist. - If you'd like, you're free to use any mechanic and/or keyword you want, existing or custom-made. - You will be judged on how well your card(s) depict Art coming to life, flavour is important! What’s with the symbol. 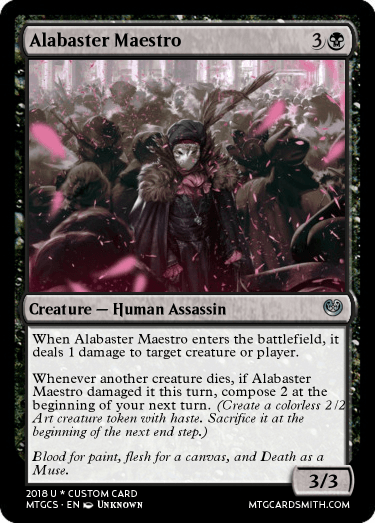 Is that being added to Cardsmith? Here was my example card. 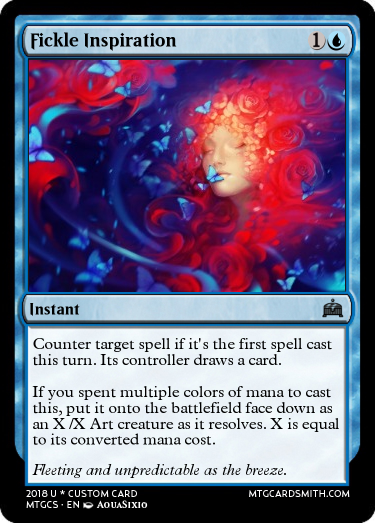 If you spent multiple colors of mana to cast this, put it onto the battlefield transformed as it resolves. It would force us to make "double sided" cards, but becomes simpler text and would allow further versatility without adding much complexity. Might these cards here be used in the final product of the set? The Rezatta set symbol got released? 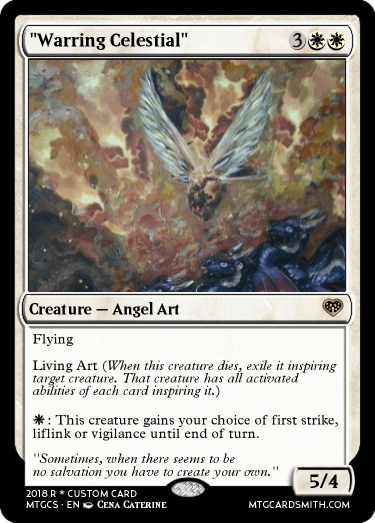 Entry number 1 is inspired by the Renaissance habit of adding a deliberate imperfection into a painting to stop it from 'rivaling the divine' - really a way of showing off since it's suggesting that the artist could make a God-like painting if they wanted to. 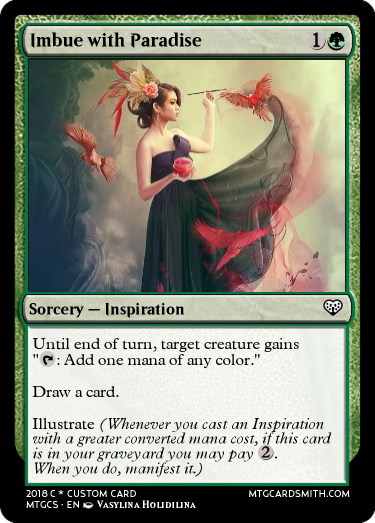 Let me explain a little of the idea behind this living art mechanic. 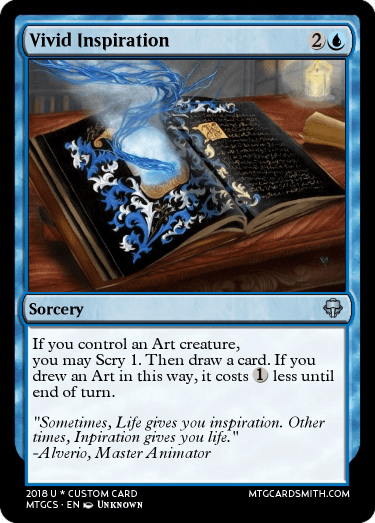 By allowing you to keep the activated abilities with a creature, it gives the creature a little extra longevity while also creating a chance to deckbuild and experiment. 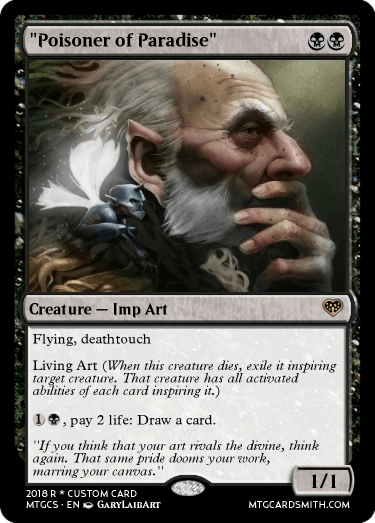 Inspiring a hexproof creature, for example, would be a good way of maintaining an activated ability you wanted to keep. 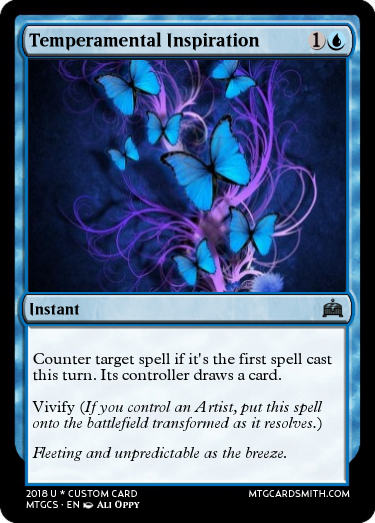 Living art also allows us to try and make cool combos. 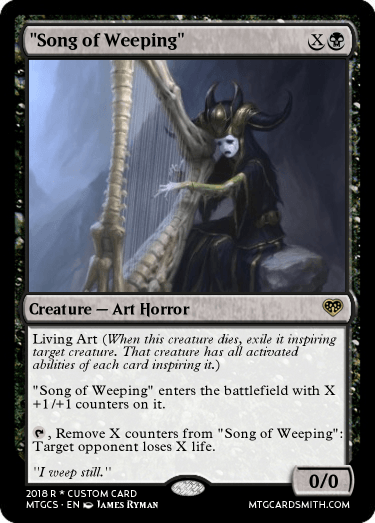 This card provides its own counters to drain your opponent, killing itself when it's finished. 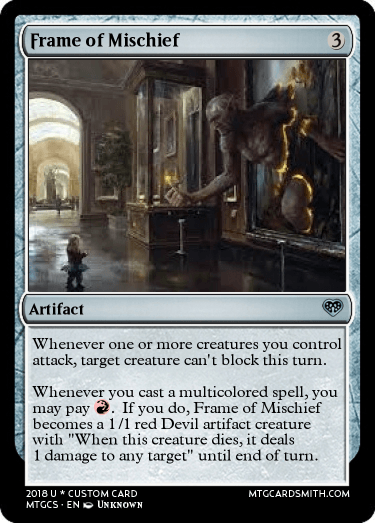 It then inspires something with a lot of counters on it: maybe that Vigean Hydropon you cast earlier. Why is a song a creature? I don't know, it's an abstract idea, I guess. 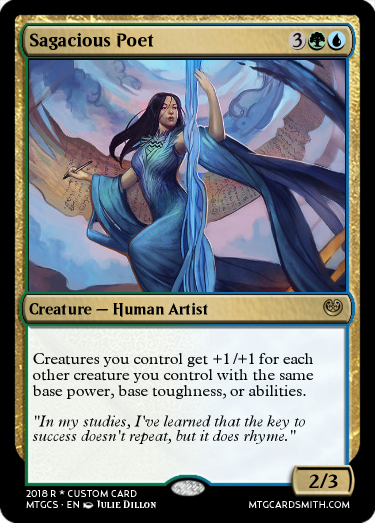 None of my entries are commons or uncommons, but I think the mechanic works at those levels as well, provided the abilities there are particularly fair ones like 3UU,T: Draw a card, or something. This one is definitely the strongest of my entries. 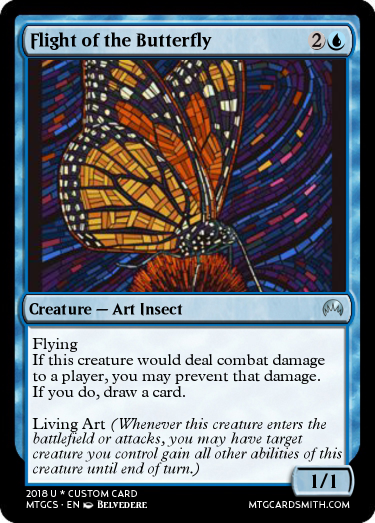 The 5/4 for 5 with flying is definitely my favourite creature baseline. It's just cool and powerful. 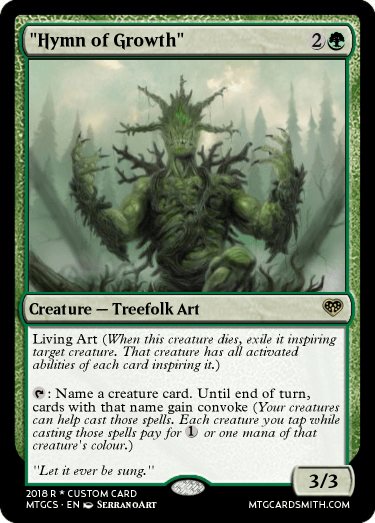 My living art mechanic doesn't grant keywords (which would be a whole other level of complexity) so it has to grant activated abilities that provide keywords. 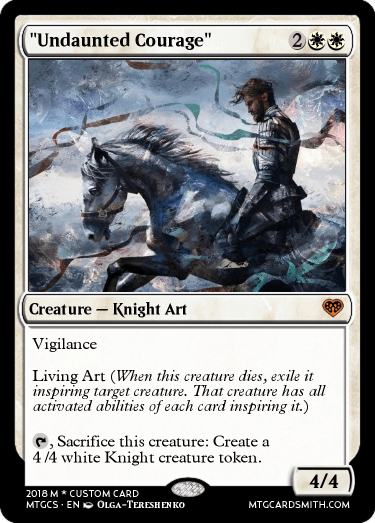 Again, players are encouraged to find a creature that, inspired with this card, benefits the best from vigilance, first strike and lifelink. It's been fun experimenting with ideas. That's my final entry. Has anyone seen the Painted World of Ariandel dlc? Alright, it is officially Sunday in every part of the world!